Easter was a pleasant time filled with sunshine, the warmth of meals and conversation with family, and the vibrancy of nature unfurling back into life as blossom covers tree branches, shoots push through soil, birdsong fills the gleaming and frogsong fills the gloaming. exploring the connectedness of all things from information systems to natural ecosystems. exhibiting the kind of quiet convinction and openness of thought needed to first see and then set aside limitations in order to reframe ideas, redesign systems and remix scenarios. combining the anchoring role of centres with the the fertility of peripheries. collapsing pasts, presents and futures to recognise they are chronological but not discrete. critically dissecting our cartographic instincts: our need to make maps to understand the world around us whilst stressing the obvious trap that the map is not the territory. Individually they were all enjoyable and thought provoking; taken together they seeped across each other into a powerful meditation on culture and change. Firstly, I read Intertwingled by Peter Morville. Morville is an experienced information architect, one of the earliest, and author of classic texts such as Information Architecture for the World Wide Web and Ambient Findability. This is a deeply personal book, based on Morville’s reading and experience, that elevates information architecture away from the practical towards the reflective and thoughtful by way of this elliptical and eclectic meditation on the skeins of information that surround us. It sketches information in broad strokes, taking in the natural world and the invisible constraints of culture in order to expose the categories and limitations that inhibit thinking and the connections and levers that change thinking. An attempt, perhaps, at a more holistic epistemology of information systems that inspires, but doesn’t always succeed (in places it is a bit too gnomic). The style was sometimes a bit too consulting speak and such short sentences suggested a better presentation as a speech than a book.At times I was confused and felt like I was chasing important points that were, however, too ephemeral to grasp. Given how much of the book is informed by influential texts Morville has encountered it is also surprising their isn’t a bibliography to accompany the provided notes (which aren’t always well referenced. Morville also has a tendancy to drop references into the text that aren’t well noted, for example infoscent, and assume a higher level of cogniscence with terms than I have. For a book about connectedness this displays a surprising lack of context and linking. The foundational position is of connectedness, a deep intertwining of things that suggests a shift from systems to ecosystems thinking. The argument in Chapter 1 suggests that as this is the nature of things, including information, and therefore information systems design needs to encompass culture, governance and synthesasia as well as analysis and architecture if it is to achieve sustainable change. I’m convinced by this argument, though the examples and structural thread in this chapter are rather eclectic. The second chapter is more coherently argued and discusses the consequences of catagorisation and the risks of confusing maps with territories. Through examples, how we architect understanding is unpicked and questioned. It is an important point that organising and structuring information is not a neutral act and as information professionals we have an ethical duty to reflect on our choices: what are we fixing and what are hiding by the labels we create. As expected from a great information architect, Morville is very good at exposing the structures of information architecture. These sections emerge as moments of clear insight from the surrounding fog of philosophical context and personal anecdote. I was once again lost slightly in the third chapter on Connections, but the fourth chapter on Culture once again felt more solid, albeit contradictory. Having spent the chapter on categories warning us that “maps are traps” the Culture chapter urges us to make cultural maps to effect change. There was much in here that resonated but overall it works best at creating a “structure of feeling”, an overall mindset about information, architecture and systems thinking. It is better than the sum of its sometimes vague parts and introduced me to a whole host of new thinkers, texts and ideas to explore by suggesting an interesting bibliographic path to wander by following up many of the quoted sources (that’s why I was so disappointed there wasn’t a full bibliography). For example Systemantics by John Gall, Thinking in Systems by Donella Meadows and Bruce Sterling’s concept of spime (objects that are tracked through space and time), are all new to me and look interesting. Next I wandered an actual path that snaked through the permaculture garden of Sandra and Santi at Simply Permaculture in Saint Jean de Duras. Their property is an experiment in applying permaculture philosophy and design to their French smallholding and this was the opening weekend of their garden visits for 2015 and part of Spring in Duras. They open up their garden to visitors and providde guided tours to demonstrate their application of permaculture and help others learn. Permaculture is a design process that using the patterns in systems found in nature to create more sustainable human systems: essentially design based on ecological principles. Permaculture was coined by Bill Mollison and David Holmgren in the 1970s as “integrated, evolving system of perennial or self-perpetuating plant and animal species useful to man”. For more information on permaculture the Essence of Permaculture provides a concise summary of the principles and ethics. As I walked, I found the garden to be an example of “applied intertwingling” taking the concepts and critical structures from Morville and applying them to the domain of cultivation. In many ways it helped me understand Morville’s themes better. Once again the map is not the territory. The permaculture domains and design principles provide a design map but in no way reflected the 5 hectare permaculture garden taking shape with loving care in France. As we were guided we learned about water management with swales, hugel beds for growing vegetables, a sustainable system of aquaponics using fish to fertilise the plants and the plants to clean and filter the water and how to get chickens to make compost. The permaculture principles emphasise connectedness, diversity and using feedback to design more sustainable systems. Each territory is different, but permaculture principles and ethics provide a cultural map that can guide sustainable cultivation. The day itself also demonstrated many of the ways people exchange information resources to learn about new things. Sandra and Santi went on a formal permaculture design course but they also described themselves as “YouTube Farmers”: if they didn’t know how to do something they searched for it using the internet. They watch lots of documentaries and do a lot of research to expand their knowledge, as well as consulting with their neighbours: long-term experts on the local terroir. Now, they are sharing their knowledge by opening their garden to curious visitors who can get information from posts located at various points on a trail through the garden or join a guided tour for more in depth information sharing. The group I was in exchanged ideas, and physical resources, between themselves and our hosts during the tour and it was probably one of the most dynamic peer learning experiences I’ve experienced. My parents were so enthused with what they had learnt they immediately went home and started a project to use their chickens to help turn their compost. 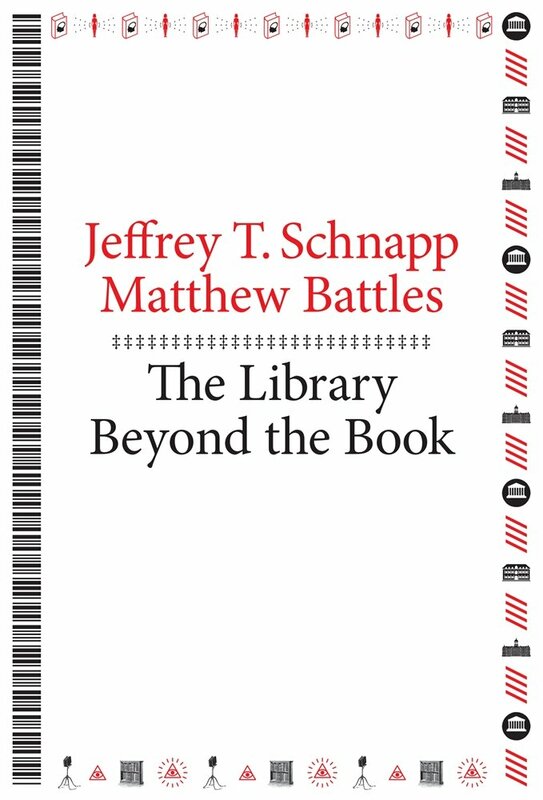 Thirdly, I read Jeffrey T. Schnapp and Matthew Battles write up their experiments on reframing the library. Stemming from a series of design studios at Harvard’s Graduate School of Design Bibliotheca: The Library Past/Present/Future leading to the Library Test Kitchen. This seemed to be another example of “applied intertwingling”, this time in the domain of cultural memory. This book does a fantastic job of tearing up the old cultural map by exposing the assumptions we make when we catagorise something as ‘library’ or ‘book, opening up connections, excavating the whole cultural process of authorship, readership and exchange and testing the limits of what libraries and books can be. It’s playful, poetic and provocative. the intermingling of the analog and the digital, books and e-books, paper and pixels. Just as the map is not the territory, so the codex is not the book. Schnapp and Battle insist that our ideas of the book, and authorship, are not fixed in formats but are “a flock of objects” suspended in the networks of their own creation and circulation. Much as we may like to fix things, they rather uncomfortably remain unfixed and spill out from their containers. I like the way they argue that books became digital, in the processes of composition and publication, even before the artefact became digital. They describe books as “a medium that requires connection” and “are coaxed to life by conversation”. They have always been “surrounded by a halo of what we now call metadata”. Gradually, the digital halo that first emanated from books in the 1970s, now erodes the reification of books as physical things connecting the residual art of oration with the emergent “peritextual nimbus” of the digital and beyond. Libraries as sites for access, congregation, contemplation, delight, discovery, dispute, escape, hiding, repose, research, secrecy, self-abnegation … a capacious cartography of qualities, which register their historical texture, weave in and out and among one another, just as much as do the forms of the book. This provocative essay suggests that we are experiencing a transitional moment as the dominance of these structures is challenged, arrived at not because of one thing but because of many interlocking changes in practice and documentary form. Nor do they suggest that books and book-holding libraries will disappear, rather that they will intermingle with new and remediated practices and forms, emerging from the traces of what books and libraries used to be and what they can be. This critical discussion provides the context for the design experiments (“forward-looking, historically informed, speculative sketches”) outlined in the rest of the book. Tucked into margins, through words and pictures the book explores services, artefacts and scenarios that play with different levers to reframe the library and draw new maps based on a library typology: Mausoleum, Cloister, Database, Warehouse, Material Epistemology, Mobile Vector, Civic Space and Instant Reading Room. Some are better then others, some are more playful, others more possible. The exciting thing is that the authors, and their students, have been willing to go beyond existing categories and limitations to see connections and suggest new ways of being for libraries that go beyond the prevailing culture. It’s also written beautifully, poetically. Such ideas are refreshing and urgent if debates about library futures aren’t to become too fixated on preserving a cherished but inhibiting past or ossified in arcane format debates that impose rigid limits on new ways of thinking. Libraries are not just places that entomb memory, they are also places where the living gather to imagine, converse, meet practical needs and find treasure. Some things will settle, to seeming permanance, others will change more frequently; not everything should change but nothing is entirely fixed. The book is packed full of suggestions for reimagining not just library spaces, services and systems but our whole library culture of authorship, publishing, acquisition and reading. It is critical, but devoted. The containers may leak and evolve, but the communion of ideas and stories will undoubtedly endure.